This week Federation is running an “Enrol to vote for TAFE” campaign on TAFE campuses and online as the federal election approaches. Many young people will be starting TAFE and some of them will not be enrolled to vote and may not be aware of the Stop TAFE Cuts campaign to safeguard public vocational education. The federal Liberal-National Government has cut more than $3 billion from TAFE, apprenticeships and vocational education. The Morrison Government has also failed to guarantee that at least 70 per cent of vocational education and training funding should go to the trusted public TAFE system rather than to low quality, for-profit private providers. Federation urges members to make public education a major election issue by ensuring people are enrolled to vote for the sake of TAFE. Deputy Secretary (Post Schools) Maxine Sharkey said members must work together to ensure that the federal and state governments do not continue their attacks on TAFE. The Stop TAFE Cuts campaign is a national initiative to stop the failed contestable-funding policy of federal and state governments. “The market model has failed our young people. It has caused a loss of confidence in the sector. There are now fewer people receiving training than before the contestable funding model was introduced. This federal election provides the community with an opportunity to save TAFE,” said Federation President, Maurie Mulheron. 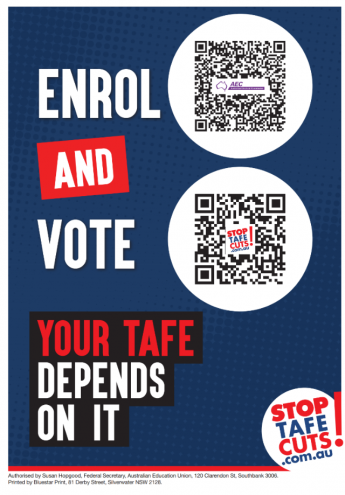 You can download posters and flyers for you campus at stoptafecuts.com.au/enrol and also sign up for the campaign. Students and community members can enrol to vote online at aec.gov.au/enrol. Look out for our Stop TAFE Cuts supporters at a TAFE college near you.